During apple season, Susan Brown can bite into hundreds of apples a day. She walks through her orchards, along rows containing hundreds of trees, biting and spitting, biting and spitting. Each year, she and her technician, Kevin Maloney, plant thousands upon thousands of apple seeds, and never know exactly what the fruit of the grown trees will taste like. Browsing through this experimental orchard, Brown likes to say, is like digging through a bag of Bertie Bott’s Every Flavor Beans, the magical Harry Potter jelly beans that can taste of anything from blueberry and banana to vomit and earwax. In a similar way, her apples might taste of cinnamon, green pepper, or diesel fuel. And there’s no way to know until she bites into one. There’s an apple, for instance, that tastes rather strongly of anise, which can be a delightful or nasty surprise, depending on your tastes. As the head of the apple-breeding program at Cornell University’s New York State Agricultural Experiment Station, one of the largest apple-breeding programs in the world, Brown is searching for fruit that no one has ever seen or tasted before—beautiful apples that can withstand the dangers of the field, that grow uniform and large, that store well, that can be shipped easily to grocery stores, that have deep and satisfying flavors, and that are, above all, crisp and juicy, the two qualities consumers most desire. By harnessing the criss-cross power of genetic variation, she can create new apples, better than any already for sale. But that means corralling the tremendous genetic diversity that apple seeds hold. “Apples just want to be different,” she says. Breeding them means working at a large scale—decades of growing thousands of trees and tasting thousands of apples—just to find and capture that one better variety of fruit. Brown has access to the USDA’s apple collection, right by her own orchards. I meet Brown on a fall morning at the experimental station in Geneva, New York, on the northern end of Seneca Lake. This is farm, wine, and gorge country, where rolling hills lead from one Finger Lake to the next, and shoreline vineyards and cider mills look out over the water. The station, with its brightly lit greenhouses and lecture halls, is on the edge of town, with easy access to the fields beyond. Brown has 33 acres of seedlings out here, and she has promised me a taste—many tastes, so many that by the end of the morning my stomach would feel a bit queasy—of what it takes to discover an apple variety good enough to get a name of its own. “We always tease—you go back in because your stomach can only take so much,” she says. “We’ll break for lunch—not that we’re hungry, but just to give a base.” There are real digestive dangers to apple tasting of this intensity. When tasting cider apples that are small, tart, and tannic, “after while you’re think, ‘I’m going to puke.’” Some varieties ferment on the tree. “You can get loopy,” she adds. She takes me past phalanxes of young trees, with fallen apples in red and yellow pools beneath them, to what she describes as a “good row.” Each tree here has the same two parent trees, which were crossbred in the hope that one of their offspring will combine the best of both. It’s the same hope that any parent has for a child, except in this case, instead of a few human babies, the parent trees can produce thousands of seedlings. This row has one parent that produces deep red apples dotted with tiny white starbursts. The other parent makes what Brown calls “the ugly apple,” a variety that gets scarf skin, a cosmetic problem, and turns almost brown by harvest time. “The ugly apple, most people consider the best apple they’ve ever eaten,” says Brown. The goal of this cross is to pretty it up so that people might want to buy it, without losing its stunning flavor. Apples need to both look and taste good. 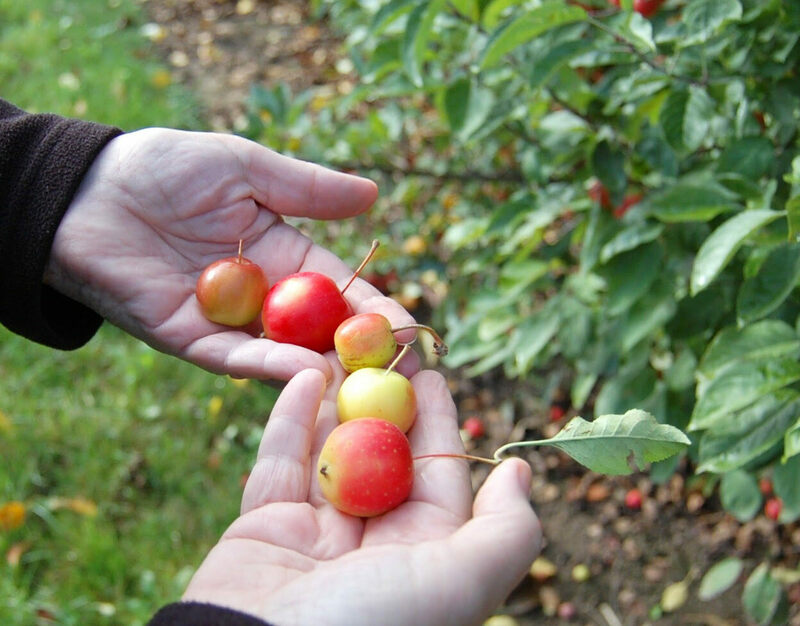 She starts walking the row, reaching into the leaves to retrieve apples and handing one from each tree to me to taste. “Feel free to spit,” she says, her mouth full. She then offers me an apple that’s russet-colored from frost. “Not bad.” Normally, she wouldn’t even taste it because of the appearance. Not everyone likes these little white starbursts. More apples. “Now that’s attractive.” “Can you taste the metallic, like a metallic taste?” “Again, not a lot of flavor.” “That’s the ugly offspring.” “Wow. Nothing much.” Brown had told me earlier that her job makes her a bit of an apple snob, and I start to understand. These aren’t bad apples—they’re right off the tree, and every one produces a satisfying crunch. But any flaw, in shape, taste, or color, immediately disqualifies it for her. She has to be so picky because apple eaters notice these subtleties, too. One consumer told her he tasted garlic in one of her apples. An apple with weather damage. After Brown and her colleagues breed these trees by scraping the pollen out of one parent’s flowers and tweezing the anthers from another, it takes four years before the progeny bear fruit. In the first year, they might only produce one or two apples. Even if Brown and Maloney, the technician, taste one of those apples and decide it’s amazing, they have to wait until the next year to see if it’ll fruit again and in enough abundance. Once they have selected a tree they like, they harvest bud sticks and start making copies. Apples don’t grow true to seed, meaning that if Brown and Maloney plant the seeds of that favored tree they’re unlikely to match the magic of the chosen apple. The apples that show up in stores—Red Delicious, Granny Smith, McIntosh, Macoun, Cortland, Honeycrisp, Empire, Gala—are all produced by clones of the first tree that produced each variety. If an apple is a candidate for commercialization, those budding clones are grafted onto different roots, to see how they grow and produce, and then are sent into grower trials, to see how they fare in other conditions. In one field we pass, Brown points out her “advanced selections”—trees laden with big apples, like overdecorated Christmas trees. They’ve been bred to stand straight, with branches starting lower to ground, which makes harvest easier. In between the clusters there are large gaps, where underperforming trees once stood. This apple shows saw fly damage. Growing up, Brown “got a little plants and a little genetics,” she says. Her mom had a garden that people traveled from miles around to see, and her dad bred racing pigeons. When she took her first plant-breeding course, in college, she was entranced by the idea that she could create something no one had ever seen. She was the first woman hired in her department, and she was the only one for years after she started. “I didn’t think I could have kids and have a career,” she says. “It wasn’t easy, but I did.” In her office, there’s a framed family tree that her daughter crafted from paper and photos, where the members of the family are represented, naturally, by apples. Hanging on the lower branches, just below the human family members, are apples representing Snapdragon and Ruby Frost, two of the greatest triumphs of Brown’s many years of labor. When Brown and Maloney first bit into Snapdragon, it was the first tree in a row. One of its parents was Honeycrisp, the new and popular variety produced in Minnesota. On the other side of its family, it had ancestors including Monroe, Melrose, and Golden Delicious. As soon as Brown and Maloney tried it, they loved it. But the tree had so few fruit; they had to wait until the next year to see if it would grow more apples of the same quality. It did, and soon they started making trees for commercial grower trials, on an unusually speedy schedule. Ruby Frost is an incredibly uniform, bright, deep red. She catches me trying, with only partial success, to eject a not-so-good bit of apple from my mouth. “Sometimes one spit is not enough,” she says. “You go through progeny like this, and you’re ready to cry.” The whole row will be bulldozed. Not long before we leave, though, she takes me to taste one of her favorites. When I bite into it, the satisfying crunch gives way to a flush of nectar and a pear-like flavor. It’s like eating an apple dipped in honey. I take a second bite, without even noticing, one of the only times I’ve taken more than one bite of a single apple all morning. “You can always tell if it’s good when you start walking to the next tree, and you’re still eating,” Brown says. I take another bite. This apple may never make it to market. The tree it came from may be bulldozed into the ground. That particular combination of crunch and nectar may never exist again. It is a very, very good apple. But if it’s not good enough to make it big, to convince people to turn from their tried-and-true favorites to an upstart newcomer, only a few people will ever have tasted it.